Yes you read that right, Ryusoul Red of Kishiryu Sentai Ryusoulger will indeed be getting a Ridewatch for the Kamen Rider Zi-O toyline! Though not the first time a Super Sentai member has been inducted into a Kamen Rider toyline (the Super Sentai Wizard Ring) or vice versa (the Den-Liner Ressha) these little crossovers of gimmicks are always really cool. The Ryusoul Red SG Ridewatch will be made available exclusively through Uniqlo stores in Japan. 3/21 is the start of the giveaway campaign, customers will have to buy two Kamen Rider Zi-O graphic T-Shirts to qualify for it. Quantities will be limited, so expect this Ridewatch to increase in value on the secondary market pretty quickly in a similar fashion to the Cross-Z & GenM Ridewatches. This is an SG Ridewatch, not DX, but it of course will still work just fine with the DX Ziku Driver. Full Kamen Rider Zi-O Merchandise Catalog Posted Online! At long last the full merchandise catalog for the next Kamen Rider series has been revealed- detailing the powers and abilities of Kamen Rider Zi-O! *Both Zi-O and the counterpart Kamen Rider Gates use the Jikan Driver to henshin. This Driver uses a primarily digital display and changes format depending on Zi-O’s attacks- the most powerful move is listed as FINISH TIME. *The Riders gain new powers from the RideWatches– small items with the faces of past Kamen Riders! These can be stored in the RideWatch Holder or compiled in the RideWatch Dizer for a combination attack! The RideWatches are not limited only to past Kamen Riders- some watches actually represent ITEMS from past shows, including the Suika Arms from Kamen Rider Gaim. The first catalog covers ALL Heisei-era Kamen Riders! *By using the RideWatches, Kamen Rider Zi-O & Kamen Rider Gates will obtain armor based on a previous Kamen Rider design. The first configurations shown in the Rider Kicks action figure line show Kamen Rider Ghost, Kamen Rider Ex-Aid, Kamen Rider Fourze, Kamen Rider OOO & Kamen Rider Decade! *Zi-O’s signature weapon is the Jikan Gilade– a sword that becomes a gun. Meanwhile, Gates is armed with the Jikan Zax– a crossbow that turns into an axe. A third weapon known as the Ride HeiSaber is also on display, which channels the powers of past Kamen Riders for attacks. *Kamen Rider Zi-O’s motorcycle is known as the Ride Striker and is summoned from a unique RideWatch. *Last but CERTAINLY not least, Kamen Rider Zi-O has a giant Mecha! Known as the Time Majin, this robo will change forms & attacks based on what RideWatch is equipped. Kamen Rider Zi-O is currently scheduled to begin on September 2 2018! Stay tuned to TokuNation between now & then as we keep you up to date on this exciting new Rider series! Kamen Rider Zi-O Toy Listings Revealed? In case you missed it, Kamen Rider Zi-O had it’s big showing a just a few days ago with the first round of toy catalog scans have appeared online. At the time of the posting, only the Gashapon scans were available to us but J-Hero.com posted a potential list for the first quarter DX Toy releases. While J-Hero claims that this list was provided to him by a vendor, we have no way of proving if this list is legitimate or not so, for now, please do take this bit of news with a grain of salt, and as always: stay tuned to Tokunation and we’ll provide you with more updates on this as it becomes available. 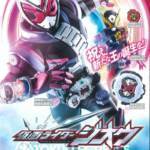 Kamen Rider Zi-O First Toy Catalog Scans Online! It’s that time of year again folks! Kamen Rider Build is sadly drawing to a close, and as we say our farewells a new hero rises to take his place: Kamen Rider Zi-O who was revealed earlier in the week. The form changes are called ArmorTime, both Gates and Zi-O uses RideWatches to activate these forms. Kamen Rider Zi-O has ArmorTimes based on Build and Ex-Aid while Gates will use forms based on Ghost and Drive. 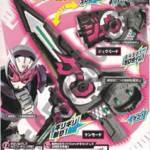 Zi-O’s default sidearm is called the JikanGrade and will have both a sword and gun mode. Do note that what we are seeing are scans for the Gashapon toys, we’ll be seeing scans for the DX stuff in the next few days. In the meantime, stay tuned to Tokunation and we’ll provide you more updates as they become available.